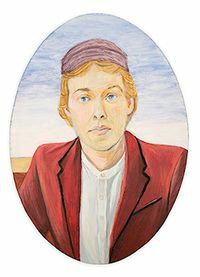 Sheri Schwartz, "Portrait of a Young Man," 2019, egg tempera on panel, 7x5 inch oval. Reception: Wednesday, March 27, 1:30-3 pm at the Niche in Founders Hall. Sheri Schwartz draws inspiration from Renaissance and ancient Roman painting in her portrayal of contemporary subjects. Traditional oil paint, egg tempera, and gilding materials are employed and imbue each with a classical presence. The jewel-like qualities of miniature painting, historical references, and illusionistic precision juxtapose psychologically charged facial expressions and distinctly contemporary hair and dress. Figures dominate each composition prominently and seem to occupy familiar “Microcosms” mirror aspects of our own. Artworks on view are miniature to small panel paintings, no larger than eleven inches in either direction. Schwartz paints mainly with a kolinsky sable round brush in a size range of three-aught to zero. She has exhibited through Connecticut and New York and instructs art courses at Middlesex Community College in Middletown, CT and Northwestern Connecticut Community College in Winsted, CT. She earned an MFA in Painting from Western Connecticut State University and BFA in Painting from Boston University. The Niche is in Founders Hall across from the Registrar’s Office. Hours: Monday through Thursday 8 a.m.–7 p.m.; Fridays 8 a.m.–4 p.m.